About the artist: Born in Brooklyn, New York in 1964, Jeff grew up with his family in Canarsie. As the youngest of 3 children, Jeff was a bit difficult to bring to the beach as a baby. He couldn�t stand the feel of the sand. While growing up, the family hardly ever went to the beach because of him. Jeff got his first camera at age 11 and chronicled the life of family and friends acquiring an appreciation of photography at an early age. When he was 13, Jeff started frequenting Sheepshead Bay and Coney Island with his older brother, Mitchell. Over the next couple of years, the smell of the ocean, and the allure of the beach drew Jeff to Coney Island, Manhattan Beach, and Riis Park, all the beaches a Brooklyn boy would ever need. Jeff continued his photography, but never thought of pursuing it professionally. After selling pictures of other artists in Sheepshead Bay with his older brother, Mitchell, he opened the art and framing store Bejart on Long Island, at age 18. Bejart was the predecessor art company to Central Galleries. While attending New York University, Jeff opened Canarsie Art and Frame which was the predecessor picture framing company to Central Galleries back in Brooklyn, New York, in July of 1984. While still in college, in 1985, Jeff opened Central Galleries on Central Avenue in Lawrence, New York. He graduated from NYU with a degree in economics and finance in 1987 while running Central Galleries. �Sometimes knowing how to pick the artists before they become successful can be more valuable than knowing how to define all of the “isms” in art.� Besides a great education, the best thing he ever got out of NYU was his wife Patty. A graduate of NYU herself with a degree in marketing, Patty Beja continued to work in the company while raising the couple’s four children. Since its inception Central Galleries has prospered and expanded twice. After moving to Oceanside, New York in 1990, Jeff started going to Sunny Atlantic Beach Club, in Atlantic Beach, New York. Eventually he began playing in the sand with his 4 children. Having a fascination with the waves and the sand, he began building mud piles and watching how the waves would break up the piles. 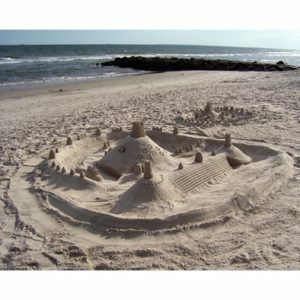 With the use of his children�s beach toys, Jeff started to build little castles and villages. Gradually, he got carried away with his castle complexes, as they got bigger and bigger. A long time member of the Sunny Atlantic Beach Club, Atlantic Beach, New York, Jeff is a familiar sight on the beach sculpting intricate sand castles for hours on end. Fondly known as �Castleman�, Jeff has taught many children of the club how to create their own sand castles using techniques he�s perfected through the years. For several years he and his children had run a Sand Castle Contest at Sunny Atlantic Beach Club. 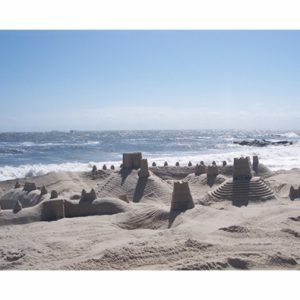 Along with his family Jeff was the winner in the family category of the Clamshell Foundation�s Annual Sand Castle Contest in East Hampton, New York in the summer of 2005, having placed 3rd two years earlier. This contest boasts over 120 participants in the category, with hundreds of participants and thousands of spectators at the contest overall. Since a sandcastle can only be a temporary art form, Jeff began to photograph his sand castles in order to have a lasting memory of the endeavor. As far as he knows, Jeff Beja is apparently the only photographer that also creates award winning sand castle sculptures offering a lasting image of them in a collectible form. He has released 3 of these images as limited edition canvas prints.